Are you ready to begin a fifty-day journey that will change your life? Research shows that you can reduce your risk of developing heart disease by over 80 percent and reduce your risk of cancer by 60 percent or greater—simply by making healthy dietary and lifestyle choices. Many who believe that they will develop disease based on their family history or genetics have most likely only inherited their family’s poor dietary and lifestyle choices. Take control of your health now! What is the status of your health—truthfully? Are you satisfied, or do you believe you should feel better? Is something missing in your personal health department? Have you tried every diet out there and still feel unhealthy? What if, in just fifty days, you could experience more energy, feel better, look better, decrease your stress, prevent disease, be more efficient and effective in your work, and enjoy each day? Would you? 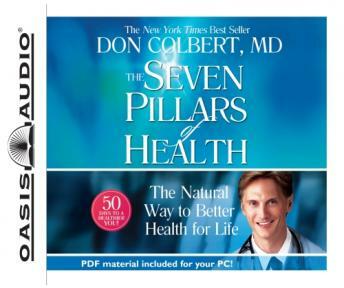 In The Seven Pillars of Health, Dr. Don Colbert shares timeless biblical truths as he reintroduces you to the basics of good health—water, sleep and rest, living food, exercise, detoxification, supplements, and coping with stress—and builds on them day by day, leading you to better health for life!